As one of the eldest of the zodiac members, Shigure is closer to Akito than most of the others -- even if Akito kicked him out of the Sohma inner complex. As such, the house that Shigure comes to live in also becomes home to Kyo, Yuki and Tohru. Shigure appears light-hearted but there is much more to him than anyone can guess. Shigure is first responsible for asking Akito's permission to have Kyo live with him and Yuki. He's also responsible for tricking Kyo into taking an enrollment test for Kaibara Public High School, where Tohru and Yuki also attend. Kyo is pretty upset at having to go to a mixed-gender school at first (especially one where Yuki also attends) but goes with it, having little choice otherwise. As the primary adult in Kyo's life when Kazuma is absent, Kyo seems to confide in Shigure often. When Kyo is upset at having yelled at Tohru several times, Shigure tells him that he needs to learn to control his temper much like he controls his strength during martial arts training. He tells Kyo that in dealing with other people, sometimes he may get hurt and sometimes he may hurt others… but it's important to learn from those experiences to become a more understanding person. He encourages Kyo to keep practicing his people skills so that one day, when he meets someone who he grows to love, he will be prepared. Kyo takes this advice to heart and begins to work hard on controlling his actions, especially around Tohru. On the day before Valentine's Day, Kyo confides in Shigure again and says that he hates Yuki and is happy maintaining that hatred. Shigure tells him that it seems that Kyo is holding onto his anger as if it's his duty to and that he may be scared to see the truth of who Yuki really is. Kyo becomes shocked at these surprisingly insightful words and runs off into the woods in a huff. When Kazuma returns from his training trip and visits Kyo at Shigure's, he meets privately with Shigure to tell him about his plan to reveal Kyo's true form to Tohru and apologises in advance. Shigure warns Kazuma that even if Tohru does accept him, Kyo may still reject her and never forgive Kazuma for his actions. Shigure also thinks to himself that even Kazuma is leaving everything up to Tohru in terms of opening up the hearts of the zodiac members. Shigure later watches the event from within the house. Much later, Shigure reveals to Tohru that as the cat, Kyo is considered to be the worst of them. The zodiac members consider themselves to be monsters but the cat is an even bigger monster than all of them. They feel relief when they see the cat being ostracised because nothing could be worse than that. 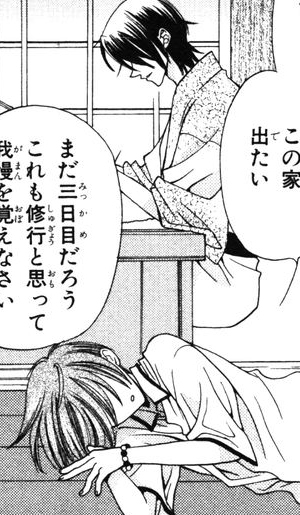 He also tells Tohru that the curse is breaking and we as readers are shown that Shigure does care about Kyo's future if he remains possessed by the spirit of the cat. For the rest (and most of the series, really), Shigure's relationship with Kyo is as an authoritative figure but he usually just ends up teasing Kyo as much as possible, usually about his somewhat obvious feelings for Tohru (much to Kyo's embarrassment). I love Shigure! While he seems carefree on the outside, he's actually quite dark and scheming. Sometimes it's easy to overlook the fact that he does genuinely care about the other zodiac members, even if his true goal is to break all ties so he may be on equal footing with Akito. He was, after all, the one who ultimately arranged for Yuki and Kyo to be able to stay outside the main Sohma complex. The best comic relief in the series, in my opinion, is when Shigure teases Kyo about his feelings for Tohru. Kyo's reactions are just so over the top and Shigure's such a dirty old man… Kyo makes the perfect straight man for Shigure. xD And I love that Kyo is able to go to Shigure and confide in him, receiving some valuable advice in return. My only complaint is that there isn't a lot of bonding later in the series between Shigure and Kyo; most of it happens before Kyo's true form is revealed to Tohru so there isn't a lot of meaningful interaction between the two outside of some hilarious comedic moments.